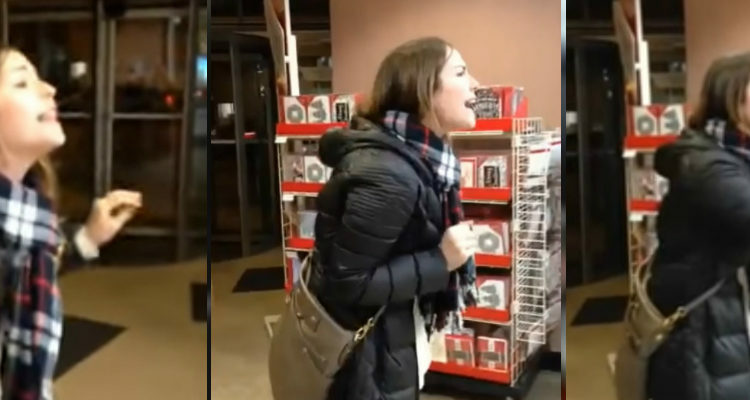 A “Wait, what?” moment at a Chicago-area arts and crafts store when a woman went on a pro-Trump rant claiming anti-white discrimination, after she was asked to purchase a $1 reusable bag. During the woman’s Thanksgiving eve meltdown at a Michael’s store, which witnesses say lasted some 30-minutes, she is heard insulting two black employees and shouting about Donald Trump. The woman claims in the video that the store cashier was trying to “force me” into buying a reusable bag for her larger items. Meantime, Grady told the online site, Chicago Patch that she was so upset by the ordeal that she started a GoFundMe campaign for the Michael’s employee targeted by the woman. Grady’s GoFundMe goal was $400, but has raised over $18, 000. Grady says that she and at least 10 other customers stuck around until police arrived to give their account of what happened, but when they showed up the angry woman had already left. The angry woman in the video has been identified as Jennifer Boyle. A second video has emerged of Boyle going off on employees in a coffee shop. Fast foward to 10:42 here. Meantime, a screenshot of a LinkedIn account in Boyle’s name that has since been removed shows that she worked in human resources at Sinai Health System. Commenting on the November 22nd incident Delta chief Edward H. Bastian, said in a memo published on Delta’s website that other travelers on the flight Nov. 22 would receive refunds for their tickets. “This individual displayed behavior that was loud, rude and disrespectful to his fellow customers,” Mr. Bastian said in the statement. He added, “We must require civility on our planes and in our facilities. The action comes after much criticism to Delta’s first reaction to the incident. After his outburst he was briefly removed from the plane, but later permitted to return to his seat.